We like bikes in the Bay Area, that’s no secret. On weekends, it’s hard to find a country road – or a Peet’s Coffee – without its own contingent of road warriors clicking away in their bike shoes and neon paraphernalia. In the city, many of us love bikes as transportation. They save us from parking tickets, traffic, and the aggravating wait for public transportation. 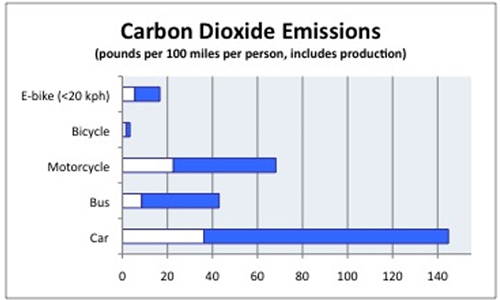 Oh yeah, and they’re environmentally awesome, at least compared to the bus or cars. But then there are the people who prefer to arrive at work without sweat stains, or who can’t make it up San Francisco’s hills. For them there is another green option, cheaper and far more efficient than a Prius: electric bikes. In each of the last few years, roughly 20 million electric bikes were sold in China, according to Chris Cherry, who studied the plug-in vehicles in China for his PhD at the University of California, Berkeley and is now an assistant professor of civil and environmental engineering at the University of Tennessee, Knoxville. It’s an annual sales rate of almost twice the 10.9 million new vehicles sold in the United States in 2008, according to the U.S. Department of Transportation. These aren’t motorbikes. They’re essentially normal bicycles, with a battery and electric motor that gives a little boost while you pedal. Cherry, along with independent consultant Jonathan Weinert and Yang Xinmiao of the Institute of Transportation Studies in Beijing, China, published a paper in 2008 outlining their research in these millions of Chinese e-bikes. All the graphs in this article utilize their data and include only electric bikes that travel less than 12.4 miles (20 kilometers) per hour. In China, the bikes won in efficiency and carbon emissions when compared to all of the other motorized vehicles. The car used in estimates was a four-door sedan-style passenger car from the 1990s, weighing about 3,400 pounds. These values were estimated for vehicles in China, however, and our American ones would vary, possibly quite a lot. Furthermore, the researchers note that public transportation modes are unlikely to take the most efficient route, so personalized modes – bikes, e-bikes, cars etc – will probably work out as more efficient per mile relative to buses. 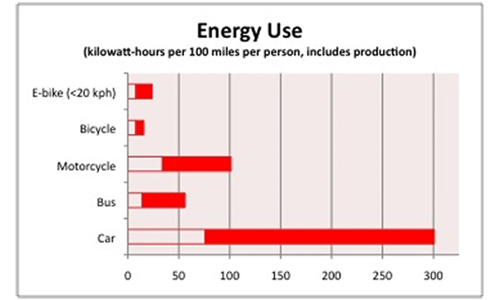 A few examples of how our energy use diverges from China’s: we use less diesel fuel, we put fewer people on a bus, we have fewer buses, we have larger cars, and we are larger. The cheapest of these bikes run around $200 in China and perhaps $700 in the United States, according to Cherry. San Francisco doesn’t appear to have any specific regulations affecting motorized bicycles of this kind, and many San Francisco bike aficionados seem to have room in their hearts for electrification. “I don’t think we mind if people have a bike with a little help,” said Andy Thornley, program director for the San Francisco Bicycle Coalition. If electric bicyclists “keep it reasonably slow and don’t take up too much space, we’ll be okay,” he said. Thornley added that one of San Francisco’s supervisors, David Chiu, has an electric bike because he didn’t want to show up disheveled to meetings in different parts the city but was unwilling to drive a car. “When you need it, you have the power to get over that hill,” Thornley said. You can’t buy an electric bike in the Mission District. “We see a few,” said Michael Kintz, repair shop manager for Valencia Cyclery. The consensus among bike shop workers throughout the Mission is that there are just a handful of electric bikes in the neighborhood. Some thought popularity might be increasing in the commuter community due to better technology, lighter bikes, and a greater interest in cutting emissions. Nearby Noe Valley Cyclery on 24th Street does sell three models of e-bikes, as well as an electric motor kit. For $1600 you can purchase the most modest ride, the Cionlli Vatavio Ecobike. That’s a lot more cash than required for a regular bike. Then again, it’s vastly less expensive than a new car. Many nicer models are available in the $2-3,000 range, or you could buy any nice bicycle of your choosing and install an electric motor kit. The Bionx kits weigh about 15 pounds and cost roughly $1700 at Noe Valley Cyclery. Most of these plug-in bikes look just like bicycles but are heavier – maybe the weight of one and a half cruisers. Some plug into the wall, some have a detachable battery that plugs into a charger. The e-bikes make almost no discernible noise and have a throttle for extra boost. On flat ground, it’s quite easy to pedal with the motor shut off. I found the ride pleasant, intuitive, and possibly a little safer than a regular bike, since there was always an extra boost to get past the opening door of a parked car or oncoming traffic. Still, I prefer the way my own Jamis commuter bike handles, particularly since the Vatavio is a folding bike with small wheels. For me the drawbacks are the weight – which makes it hard to carry the bike up BART stairs – and the purchase price, both of which may decrease with time. Then again, if I had to choose between this mode of travel and looking for parking for 20 minutes, the e-bike would win every time. There are hundreds of companies that make these bikes in China, and several brands and styles available here, with the main differences being price and the type of batteries. Lead acid batteries are the primary environmental issue with the millions of electric bikes in China, according to Cherry’s research. A large percentage of the toxic metal is lost to the environment when it is smelted or batteries are recycled, perhaps as much as 30 percent. In the United States, we are rarely so desperate for cash as to smelt lead in our back yards, and regulations are followed more closely, so the rate of lead lost in production here is about 5 percent. Furthermore, many of the electric bikes sold here have costlier, cleaner lithium ion or nickel metal hydride batteries, which avoid the need for lead. The Prius uses a nickel metal hydride battery. 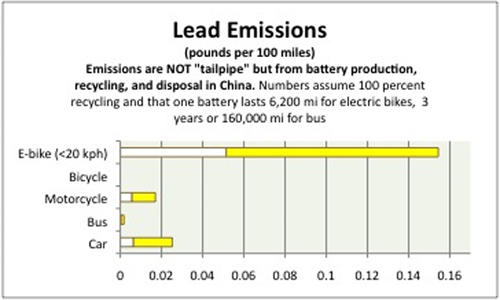 Though Cherry’s studies conclude that electric bikes are widely beneficial in China, he said he had not studied their effects in the United States. “If you ban electric bikes, they have to go onto the bus system,” Cherry said about Chinese e-bike riders. That makes calculations easier. “In the case of the U.S. it’s totally uncertain who will become the electric bike market,” he said. No one yet knows if e-bikes are replacing regular bikes, public transit, or cars in the United States. One possible use for electric bikes is to help get commuters to and from public transportation. Many commuters drive because getting to BART or Caltrain isn’t worthwhile. Paying for parking a car at BART may be too expensive, or waiting for the bus and then the train takes too much time. Linda Novick, also a researcher at the University of California, worked on a transit study of BART connectivity that incorporated electric bike use in the East Bay. Participants used Segway scooters or e-bikes to travel from BART to work, or for errands during the work day. 1 Cherry, Christopher R., Weinert, Jonathan X., and Xinmiao, Yang., Comparative environmental impacts of electric bikes in China. Transportation Research Part D 14 (2009) 281–290. NextWhat Would Uncle Jesse Do? Electric bikes are cool! 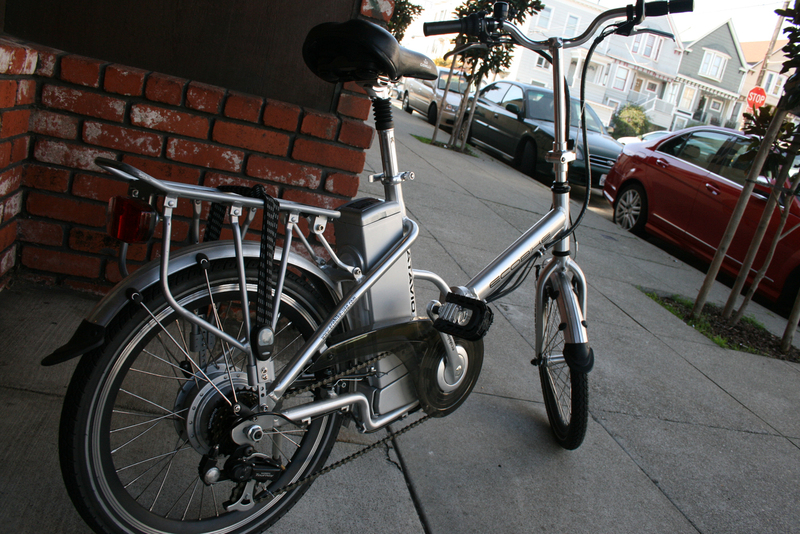 The new Pedego Comfort Cruisers (www.pedego.com) are now available at Electric Bicycle Outlet,660 Bryant Street Unit B San Francisco. Call them at (415) 978-9664 and you can arrange a free test ride. I have had an electric motion systems E+ bike since april 2009 and LOVE IT!!!! I commute in SF to work in the mission and my work regularly requires me to cross the city for meetings, I can go over 17th street easily in work clothes several times to my various meetings. The E+ compared to some of the other options was the only one that seems to have the oomph to take on the SF hills with ease. I got mine at Noe Valley Cyclery after a successful test ride up 24th st, hill! There is a new Electric Bike shop in San Francisco. The New Wheel sells Ohm Cycles elegant electric bikes exclusively and does personal one-on-one test rides. Learn more at http://www.newwheel.net.